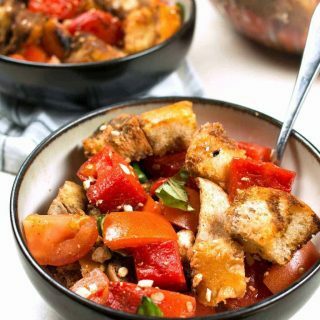 Grilled watermelon chicken panzanella salad is a great unique addition to any summer barbecue! It’s easy to make and full of color and flavor. When I think of summer, I think of watermelon. Big, juicy slices of sweet and ripe watermelon. I also think of grilling. Because, well, summer. Why not combine the two, right? I have added watermelon to caprese salad before and it was amazing. Sometimes that extra bit of sweetness can really change up a traditional dish. 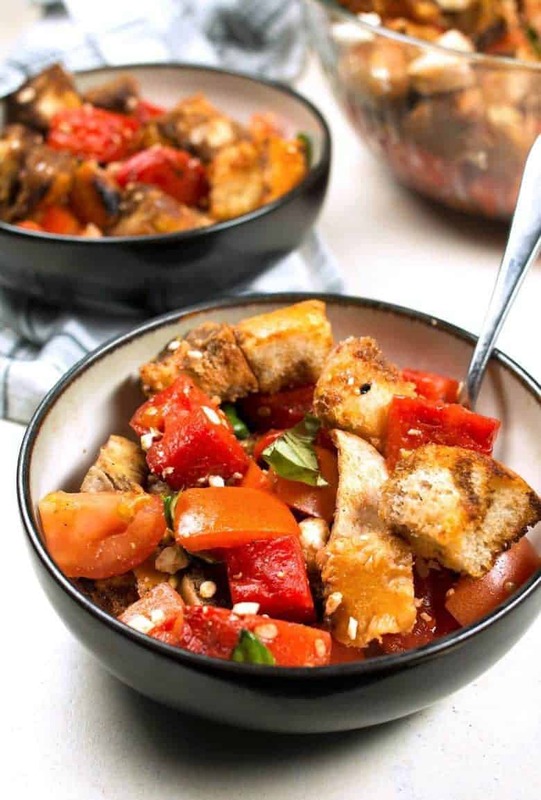 Like panzanella salad. I’m not sure if you are familiar with it, but it’s basically a salad made out of stale bread. It’s a great way to use up old crusty bread when you have made enough homemade croutons. 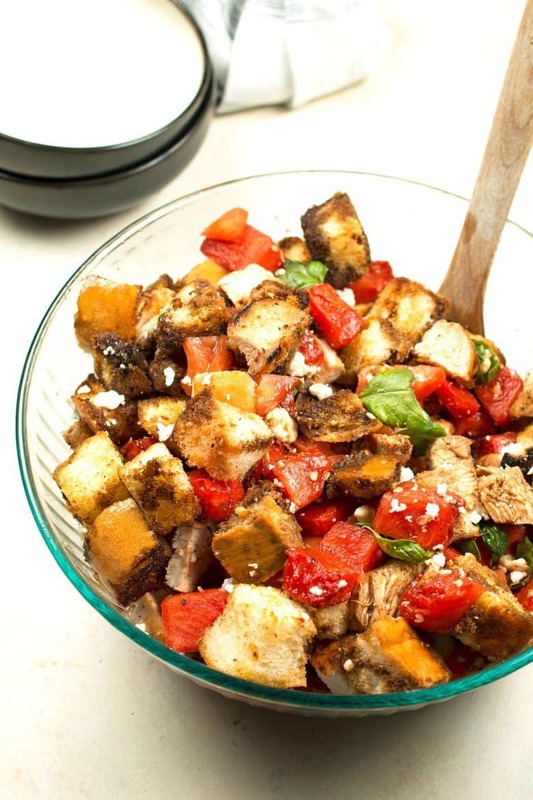 Also, panzanella salad is incredibly easy to make. That makes it the perfect addition to any summer party. Or a weeknight dinner – it really can be made in a jiffy. Grilling the watermelon caramelizes the sugars and adds layer upon layer to its flavor. You are going to fall in love. Watermelon should be eaten shortly after it is grilled so make sure you do that part last. 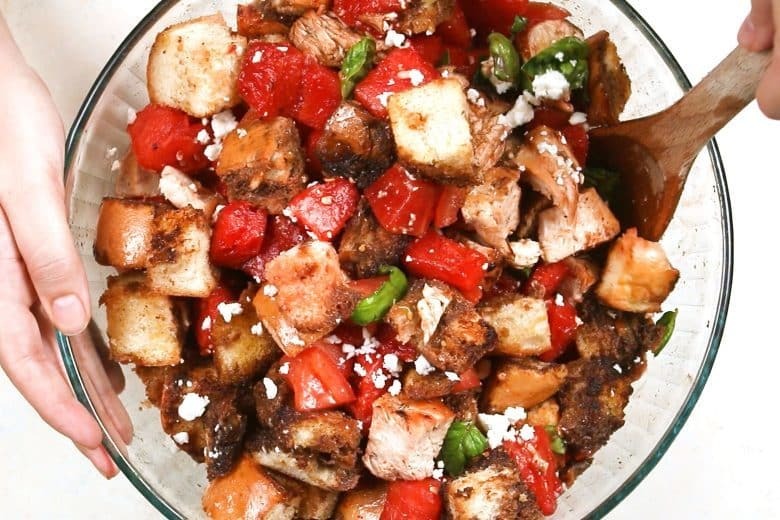 If you have time, let the panzanella salad sit for about 30 minutes before you add the chicken and watermelon. If you don’t…. just eat. That’s what I do and it is still delicious. Plus, I’m a long eater (I talk with my hands a lot and often.) By the time I am done eating, it’s been about 30 minutes. I created this recipe as part of my partnership with Peapod and the recipe website FromthePod.com. I’m part of a group of great food bloggers creating awesome recipes with Peapod in mind. Preheat oven to 350 degrees. Light a grill to medium high heat. In a medium bowl, combine the 3/4 cup extra virgin olive oil, balsamic vinegar, kosher salt and black pepper with a whisk. Toss the bread chunks in half of the balsamic vinaigrette. Spread the bread chunks out on a sheet pan and toast in the oven for 15 minutes. Remove sheet pan from oven and set aside. Blot chicken breasts with a paper towel and rub with a little olive oil. Season both sides with salt and pepper. Place the chicken on the hottest part of the grill and cook both sides for 6 minutes. Internal temperature of chicken should reach 165 degrees F. Remove the chicken breasts from the grill and set on a plate to rest. Rub olive on both sides of each watermelon crescent. 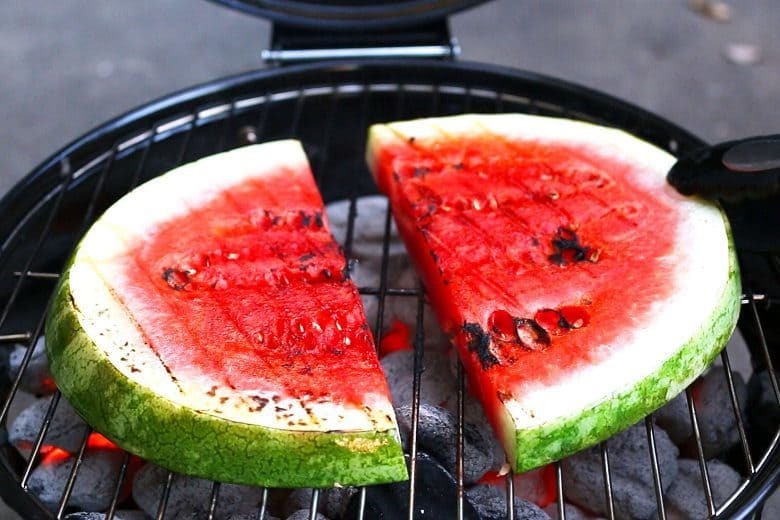 Place watermelon flat on the grill. Grill each side for 3 minutes, then remove from grill. You may need to do this step in batches. Cut the chicken breasts and watermelon into chunks. Pour the toasted bread into a large bowl. Add the grilled chicken, grilled watermelon, tomatoes, basil, feta cheese and remaining balsamic vinaigrette. Toss until well mixed. Season to taste with salt and pepper and serve immediately.